Iran and the Iranian Plateau, the Caucasus, Anatolia, Central Asia, Mesopotamia, northwestern South Asia, and as large immigrant communities in North America and Western Europe. 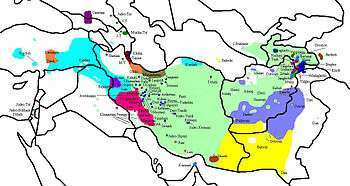 Iranian languages, a branch of the Indo-European language family. Sunni Islam (including Sufis), Shia Islam, Irreligion, Agnosticism, Christianity (Orthodox, Georgian Orthodox, Protestantism, and Catholicism), Atheism, Zoroastrianism, Nestorianism, Judaism, Bahá'í, Paganism, and Yazdanism. The Iranian peoples or Iranic peoples are a diverse Indo-European ethno-linguistic group that comprise the speakers of the Iranian languages. Proto-Iranians are believed to have emerged as a separate branch of the Indo-Iranians in Central Asia in the mid 2nd millennium BC. At their peak of expansion in the mid 1st millennium BC, the territory of the Iranian peoples stretched across the Iranian Plateau and the entire Eurasian Steppe from the Great Hungarian Plain in the west to the Ordos Plateau in the east. The Western Iranian Persian Empires came to dominate much of the ancient world at this time, leaving an important cultural legacy, while the Eastern Iranian nomads of the steppe played a decisive role in the development of Eurasian nomadism and the Silk Route. Ancient Iranian peoples include the Alans, Bactrians, Dahae, Massagetae, Medes, Khwarezmians, Parthians, Saka, Sarmatians, Scythians, Sogdians and other peoples of Central Asia, the Caucasus, Eastern Europe, and the Iranian Plateau. 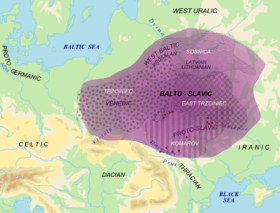 In the 1st millennium AD, their area of settlement was reduced as a result of Slavic, Germanic, Turkic and Mongol expansions and many being subjected to Slavicisation. The Iranian peoples include Balochs, Kurds, Gilaks, Lurs, Mazanderanis, Ossetians, Pashtuns, Pamiris, Persians, Tajiks, Talysh people, Wakhis and Yaghnobis. Their current distribution spreads across the Iranian plateau, and stretches from the Caucasus in the north to the Persian Gulf in the south, and from Xinjiang in the east to eastern Turkey in the west—a region that is sometimes called the Iranian cultural continent, and represents the extent of the Iranian languages and significant influence of the Iranian peoples through the geopolitical reach of Greater Iran. The term Iran derives directly from Middle Persian Ērān (𐭠𐭩𐭥𐭠𐭭) and Parthian Aryān. The Middle Iranian terms ērān and aryān are oblique plural forms of gentilic ēr- (in Middle Persian) and ary- (in Parthian), both deriving from Old Persian ariya- (𐎠𐎼𐎡𐎹), Avestan airiia- (𐬀𐬌𐬭𐬌𐬌𐬀), and Proto-Iranian arya-. The academic usage of the term Iranian is distinct from the state of Iran and its various citizens (who are all Iranian by nationality), in the same way that the term Germanic peoples is distinct from Germans. Many inhabitants of Iran are not necessarily ethnic Iranians by virtue of not being speakers of Iranian languages. The language referred to as Proto-Indo-European (PIE): is ancestral to the Celtic, Italic (including Romance), Germanic, Baltic, Slavic, Indo-Iranian, Albanian, Armenian, Greek, and Tocharian languages. The Iranians had domesticated horses, had traveled far and wide, and from the late 2nd millennium BCE to early 1st millennium BCE they had expanded from the Eurasian Steppe and settled on the Iranian Plateau. 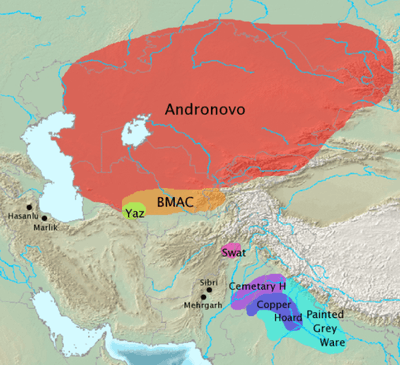 By the early 1st millennium, Ancient Iranian peoples such as Medes, Persians, Bactrians, and Parthians populated the Iranian plateau, and other Scythian tribes, along with Cimmerians, Sarmatians and Alans populated the steppes north of the Black Sea. The Scythian and Sarmatian tribes would quickly spread as far west as the Great Hungarian Plain, while mainly settling in Ukraine, Southern European Russia, and the Balkans, while other Scythian tribes, such as the Saka, spread as far east as Xinjiang, China. Scythians as well formed the Indo-Scythian Empire, and Bactrians formed a Greco-Bactrian Kingdom founded by Diodotus I, the satrap of Bactria. The Kushan Empire, with Bactrian roots/connections, once controlled much of Pakistan, Afghanistan, and Tajikistan. The Kushan elite (who the Chinese called the Yuezhi) were either a Tocharian-speaking (another Indo-European branch) people or an Eastern Iranian language-speaking people. 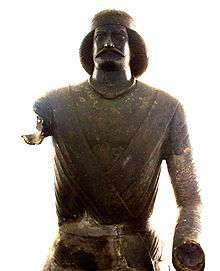 Bronze Statue of a Parthian nobleman, National Museum of Iran. 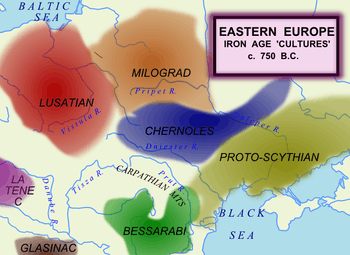 Archaeological cultures in Eastern-Central Europe at the beginning of the Iron Age, showing the location of the "Proto-Scythian culture", alongside the Balto-Slavic cultures (Lusatian, Milograd and Chernoles) C. 750 BC. During the 1st centuries of the 1st millennium BCE, the ancient Persians established themselves in the western portion of the Iranian plateau and appear to have interacted considerably with the Elamites and Babylonians, while the Medes also entered in contact with the Assyrians. Remnants of the Median language and Old Persian show their common Proto-Iranian roots, emphasized in Strabo and Herodotus' description of their languages as very similar to the languages spoken by the Bactrians and Soghdians in the east. Following the establishment of the Achaemenid Empire, the Persian language (referred to as "Farsi" in Persian) spread from Pars or Fars Province to various regions of the Empire, with the modern dialects of Iran, Afghanistan (also known as Dari) and Central-Asia (known as Tajiki) descending from Old Persian. The Sarmatians differed from the Scythians in their veneration of the god of fire rather than god of nature, and women's prominent role in warfare, which possibly served as the inspiration for the Amazons. At their greatest reported extent, around 1st century AD, these tribes ranged from the Vistula River to the mouth of the Danube and eastward to the Volga, bordering the shores of the Black and Caspian Seas as well as the Caucasus to the south. 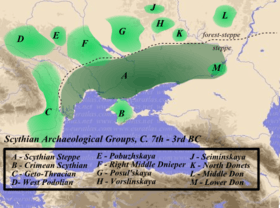 Their territory, which was known as Sarmatia to Greco-Roman ethnographers, corresponded to the western part of greater Scythia (mostly modern Ukraine and Southern Russia, also to a smaller extent north eastern Balkans around Moldova). According to authors Arrowsmith, Fellowes and Graves Hansard in their book A Grammar of Ancient Geography published in 1832, Sarmatia had two parts, Sarmatia Europea  and Sarmatia Asiatica  covering a combined area of 503,000 sq mi or 1,302,764 km2. 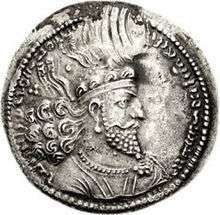 Silver coin of the Indo-Scythian king Azes II (reigned c. 35–12 BCE). Buddhist triratna symbol in the left field on the reverse. Starting with the reign of Omar in 634 CE, Muslim Arabs began a conquest of the Iranian plateau. The Arabs conquered the Sassanid Empire of the Persians and seized much of the Byzantine Empire populated by the Kurds and others. Ultimately, the various Iranian peoples, including the Persians, Pashtuns, Kurds and Balochis, converted to Islam, while the Alans converted to Christianity, thus laying the foundation for the fact that the modern-day Ossetians are Christian. The Iranian peoples would later split along sectarian lines as the Persians (and later the Hazara) adopted the Shi'a sect. As ancient tribes and identities changed, so did the Iranian peoples, many of whom assimilated foreign cultures and peoples. There are an estimated 150 to 200 million native speakers of Iranian languages, the five major groups of Persians, Lurs, Kurds, Baloch, and Pashtuns accounting for about 90% of this number. Currently, most of these Iranian peoples live in Iran, Afghanistan, the Caucasus (mainly Ossetia, other parts of Georgia, Dagestan, and Azerbaijan), Iraqi Kurdistan and Kurdish majority populated areas of Turkey, Iran and Syria, Tajikistan, Pakistan and Uzbekistan. There are also Iranian peoples living in Eastern Arabia such as northern Oman and Bahrain. 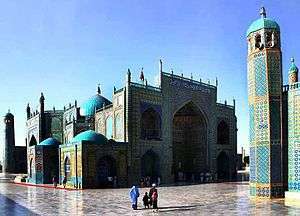 Mazari Sharif's Blue Mosque in Afghanistan is a structure of cobalt blue and turquoise minarets, attracting visitors and pilgrims from all over the world. Many such Muslim architectural monuments can be attributed to the efforts of the Iranian peoples who are predominantly followers of Islam today. Modern speakers of Iranian languages mainly follow Islam. Some follow Judaism, Christianity, Zoroastrianism, and the Bahá'í Faith, with an unknown number showing no religious affiliation. Overall the numbers of Sunni and Shia among the Iranian peoples are equally distributed. Most Kurds, Tajiks, Pashtuns, and Baloch are Sunni Muslims, while the remainder are mainly Twelver Shi'a, comprising mostly Persians in Iran, and Hazaras in Afghanistan. Zazas in Turkey are largely Alevi, while the Pamiri peoples in Tajikistan and China are nearly all Ismaili. The Christian community is mainly represented by the Armenian Apostolic Church, followed by the Russian Orthodox and Georgian Orthodox Ossetians followed by Nestorians. Judaism is followed mainly by Persian Jews, Kurdish Jews, Bukharian Jews (of Central Asia) and the Mountain Jews (of the Caucasus), most of whom are now found in Israel. The historical religion of the Persian Empire was Zoroastrianism and it still has a few thousand followers, mostly in Yazd and Kerman. They are known as the Parsis in the Indian subcontinent, where many of them fled in historic times following the Arab conquest of Persia, or Zoroastrians in Iran. Another ancient religion is the Yazidi faith, followed by some Kurds in northern Iraq, as well as the majority of the Kurds in Armenia. Elements of pre-Islamic Zoroastrian and Paganistic beliefs persist among some Islamized groups today, such as the Tajiks, Pashtuns, Pamiri peoples and Ossetians. J1-M267; typical of Semitic peoples, was rarely over 10% in Iranian groups, but as high as 30% in Assyrian minorities of Iran. R1b – M269: is widespread from Ireland to Iran, and is common in highland West Asian populations such as Armenians,Turks and Iranians – with an average frequency of 8.5%. Iranian R1b belongs to the L-23 subclade, which is an older than the derivative subclade (R1b-M412) which is most common in western Europe. R1a (subclade not further analyzed) was the predominant haplogroup, especially amongst Pashtuns and Tajiks. The presence of "east Eurasian" haplogroup C3, especially in Hazaras (33-40%), in part linked to Mongol expansions into the region.. Overall in Iran, native population groups do not form tight clusters either according to language or region. Rather, they occupy intermediate positions among Near Eastern and Caucasus clusters. Some of the Iranian groups lie within the Near Eastern group (often with such as the Turks and Georgians), but none fell into the Arab or Asian groups. 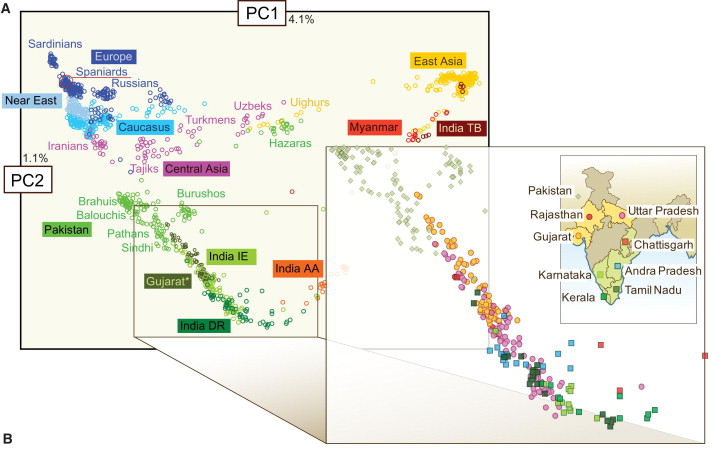 Some Iranian groups in Iran, such as the Gilaki's and Mazandarani's, have paternal genetics (Y-DNA) virtually identical to South Caucasus ethnic groups, while the small Iranian Baloch ethnic group, being the only outliers who have heavy pulls towards South Asia. In Afghanistan, Iranian population groups such as the Pashtuns and Tajiks occupy intermediate positions amongst northwestern South Asian ethnic groups, such as along the Baloch, Brahui, Kashmiri's and Sindhi's, with a small minor pull towards West Asia. ↑ In the Avesta the airiia- are members of the ethnic group of the Avesta-reciters themselves, in contradistinction to the anairiia-, the "non-Aryas". 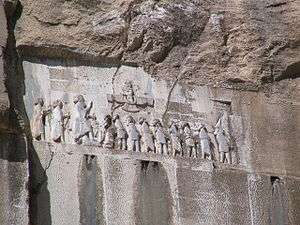 The word also appears four times in Old Persian: One is in the Behistun inscription, where ariya- is the name of a language or script (DB 4.89). The other three instances occur in Darius I's inscription at Naqsh-e Rustam (DNa 14-15), in Darius I's inscription at Susa (DSe 13-14), and in the inscription of Xerxes I at Persepolis (XPh 12-13). In these, the two Achaemenid dynasts describe themselves as pārsa pārsahyā puça ariya ariyaciça "a Persian, son of a Persian, an Ariya, of Ariya origin." "The phrase with ciça, “origin, descendance”, assures that it [i.e. ariya] is an ethnic name wider in meaning than pārsa and not a simple adjectival epithet". Iran: Library of Congress, Library of Congress – Federal Research Division. "Ethnic Groups and Languages of Iran" (PDF). Retrieved 2009-12-02. (Persian and Caspian dialects-65% Kurdish 8%-Luri/Bakhtiari 5%- Baluchi 4%):80% of the population or approximately 63 million people. Iranian speakers in Bahrain, the Persian Gulf, Western Europe and USA, 3 million. ↑ R.N Frye, "IRAN v. PEOPLE OF IRAN in Encycloapedia Iranica. "In the following discussion of "Iranian peoples," the term "Iranian" may be understood in two ways. It is, first of all, a linguistic classification, intended to designate any society which inherited or adopted, and transmitted, an Iranian language. The set of Iranian-speaking peoples is thus considered a kind of unity, in spite of their distinct lineage identities plus all the factors which may have further differentiated any one group’s sense of self." 1 2 3 H. W. Bailey, "Arya" in Encyclopedia Iranica. Excerpt: "ARYA an ethnic epithet in the Achaemenid inscriptions and in the Zoroastrian Avestan tradition. "Arya an ethnic epithet in the Achaemenid inscriptions and in the Zoroastrian Avestan tradition". Also accessed online in May, 2010. ↑ Professor Gilbert Lazard: The language known as New Persian, which usually is called at this period (early Islamic times) by the name of Dari or Parsi-Dari, can be classified linguistically as a continuation of Middle Persian, the official religious and literary language of Sassanian Iran, itself a continuation of Old Persian, the language of the Achaemenids. Unlike the other languages and dialects, ancient and modern, of the Iranian group such as Avestan, Parthian, Soghdian, Kurdish, Ossetian, Balochi, Pashto,Armenian etc., Old Middle and New Persian represent one and the same language at three states of its history. It had its origin in Fars (the true Persian country from the historical point of view) and is differentiated by dialectical features, still easily recognizable from the dialect prevailing in north-western and eastern Iran in Lazard, Gilbert 1975, "The Rise of the New Persian Language" in Frye, R. N., The Cambridge History of Iran, Vol. 4, pp. 595–632, Cambridge: Cambridge University Press. 1 2 "Article in 1911 Britannica". 58.1911encyclopedia.org. Archived from the original on 20 August 2008. Retrieved 2009-06-21. ↑ "Avestan xᵛarǝnah-, etymology and concept by Alexander Lubotsky" — Sprache und Kultur. Akten der X. Fachtagung der Indogermanischen Gesellschaft, 22.-28. September 1996, ed. W. Meid, Innsbruck (IBS) 1998, 479–488. . Retrieved 4 June 2006. ↑ "Kurdish: An Indo-European Language By Siamak Rezaei Durroei" Archived 17 June 2006 at the Wayback Machine. — University of Edinburgh, School of Informatics. . Retrieved 4 June 2006. Archived 17 June 2006 at the Wayback Machine. ↑ "The Iranian Language Family, Khodadad Rezakhani" — Iranologie. . Retrieved 4 June 2006. ↑ Nasidze, Ivan; Quinque, Dominique; Ozturk, Murat; Bendukidze, Nina; Stoneking, Mark (1 July 2005). "MtDNA and Y-chromosome Variation in Kurdish Groups". 69 (4): 401–412. doi:10.1046/j.1529-8817.2005.00174.x – via Wiley Online Library. ↑ "History of Iran-Chapter 2 Indo-Europeans and Indo-Iranians" — Iranologie . Retrieved 4 June 2006. ↑ "Azerbaijan-Iran Relations: Challenges and Prospects" — Harvard University, Belfer Center, Caspian Studies Program . Retrieved 4 June 2006. ↑ "Cambridge Genetic Study of Iran" — ISNA (Iranian Students News Agency), 06-12-2006, news-code: 8503-06068 . Retrieved 9 June 2006. ↑ Grugni (2012). "Ancient Migratory Events in the Middle East: New Clues from the Y-Chromosome Variation of Modern Iranians". PLOS ONE. 7: e41252. doi:10.1371/journal.pone.0041252. PMC 3399854 . PMID 22815981. ↑ Semino, Ornella; et al. (May 2004). "Origin, Diffusion, and Differentiation of Y-Chromosome Haplogroups E and J: Inferences on the Neolithization of Europe and Later Migratory Events in the Mediterranean Area". American Journal of Human Genetics. 74 (5): 1023–1034. doi:10.1086/386295. PMC 1181965 . PMID 15069642. ↑ "Family Tree DNA - Genetic Testing for Ancestry, Family History & Genealogy". ↑ Myres; et al. (2011). "A major Y-chromosome haplogroup R1b Holocene era founder effect in Central and Western Europe". European Journal of Human Genetics. 19: 95–101. doi:10.1038/ejhg.2010.146. PMC 3039512 . PMID 20736979. ↑ Rootsi; et al. (2012). "Distinguishing the co-ancestries of haplogroup G Y-chromosomes in the populations of Europe and the Caucasus". European Journal of Human Genetics. 20: 1275–1282. doi:10.1038/ejhg.2012.86. PMID 22588667. 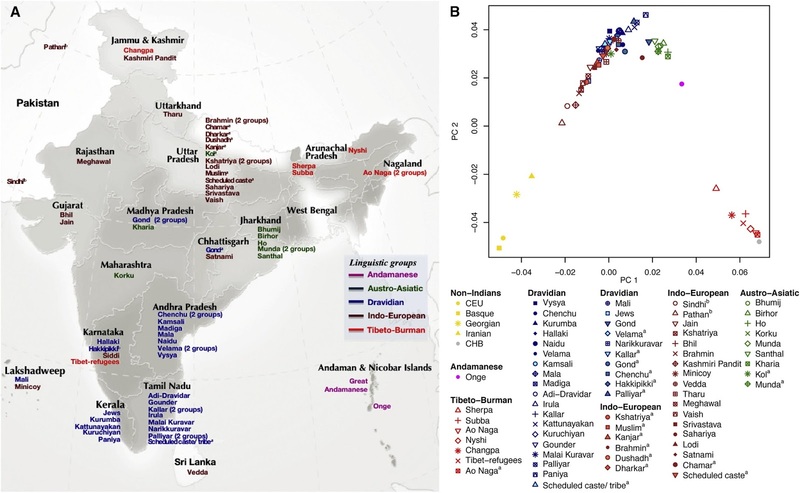 ↑ "Major admixture in India took place ~4.2-1.9 thousand years ago (Moorjani et al. 2013)". Retrieved 19 April 2014. ↑ Grugni, Viola; Battaglia, Vincenza; Kashani, Baharak Hooshiar; Parolo, Silvia; Al-Zahery, Nadia; Achilli, Alessandro; Olivieri, Anna; Gandini, Francesca; Houshmand, Massoud; Sanati, Mohammad Hossein; Torroni, Antonio; Semino, Ornella (18 July 2012). "Ancient Migratory Events in the Middle East: New Clues from the Y-Chromosome Variation of Modern Iranians". PLOS ONE. 7 (7): e41252. doi:10.1371/journal.pone.0041252. PMC 3399854 . PMID 22815981 – via PLoS Journals.